We like to do that on Newsnet. Create images of an alternative future and look at the past to find different real stories, so often hidden from view in Brexit Britain, seeking a past that never really existed. Stir it up is a different kind of cookbook. No Michelin star chefs, no Jamie Oliver, no Delias nor Nigellas. Members of Yes Berwickshire and their friends contributed recipes, some traditional but most influenced, in some way, by other culinary cultures and travel. If we are what we eat then Scotland has become a country of the world – through taste, experiment, travel and interaction. A nation comfortable in its identity is not afraid to learn, to experiment, to borrow and add. 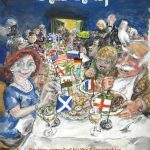 Stir it up offers a glimpse of the multi-cultural Scotland of today, international in outlook and occasionally adventurous, recognising our sometimes exploitive actions in days of Empire. Reflecting a journey, a wander through culinary influences that changed the foods we ate as we embraced new ingredients and cultures to enrich our own, adding a soupçon of spice to our lives. Stir it up is a different and kind of cookbook and every recipe comes with a quirky and interesting story. Scotland is a producer of quality food and drink, accounting for a large part of our exports. Scotland the Brand stands for quality but it can never stand still, always reaching out for new ideas, new associations in an ever changing world. This is not a book for the bookshelves but one to use and that is why it is spiral bound, to lie flat as a practical reference whilst gathering ingredients and checking method. Nor is it a collection of complex and time consuming recipes, most are very straightforward and with a little input offer a cost advantage compared to prepared and expensive supermarket dishes. Eric Ritchie, a well-known Scottish artist and Yes Berwickshire member, has provided a number of delightful illustrations to complement the photographs accompanying each recipe. Lesley Riddoch kindly provided the introduction between her travels to our Scandinavian neighbours and filming in Norway with Phantom Power Films. 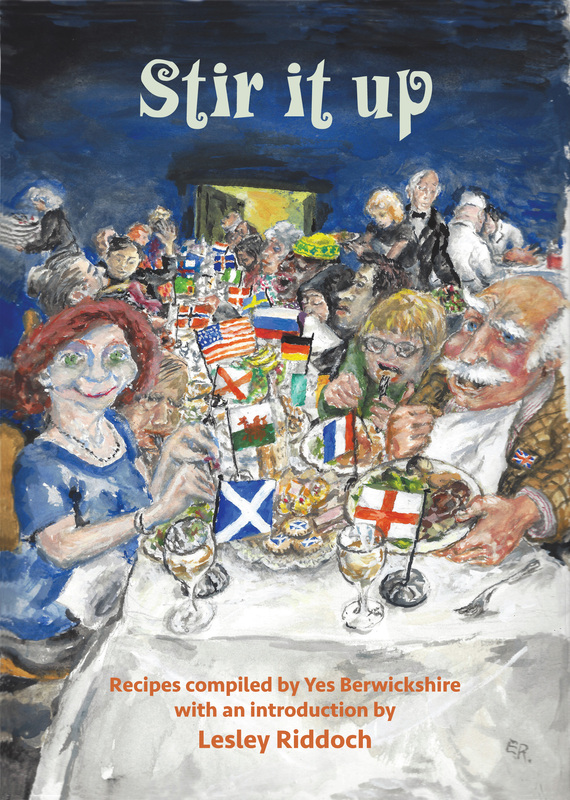 Stir it up is published by Twinlaw Publishing, an not-for-profit small publisher working on a collaborative basis with authors on books, mainly of Scottish interest. Twinlaw Publishing is linked to Newsnet Scotland as part of a stable of wider publishing connectivity. Stir it up is available from Twinlaw Publishing at £7.99 plus p&p. Treat yourself. Also a wonderful gift for those you may still be struggling to decide what to give for Christmas. The Twinlaw website will automatically calculate the correct postage on orders for multiple copies – reducing the cost per copy.